How would you respond if your worst mistake became public knowledge? If your lowest moment was captured on film and shared with the world? What would you say if you hadn’t even known that moment existed until your mistake went viral? 15-year-old Jasmine Lovely is living the perfect life until a house party with friends spins out of control. A combination of alcohol and peer pressure results in Jasmine making choices that she will deeply regret - once she remembers what she did. Looking at the modern issue of cyberbullying from the viewpoint of a perpetrator, Saving Jazz is a thought-provoking exploration of how a few minutes of stupidity can have lifelong consequences in a world where every moment, good and bad, can be captured and shared. As the parent of teenagers, Saving Jazz was a sobering and challenging read. Jazz Lovely was an everyday teen who made a series of bad decisions. Unfortunately, because her actions were recorded, those bad decisions became public knowledge, impacting her own life and the lives of those close to her into the future. Kate McCaffrey uses Jazz’s experiences as a teen and young adult to explore the significant ongoing consequences of the misuse of technology for cyberbullying. Saving Jazz is a sobering reminder that images shared online can cast a very long shadow. With smartphones and social media such an intrinsic part of how teens communicate and share information, books such as Saving Jazz are important conversation starters. 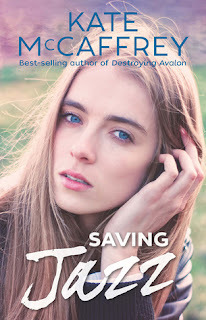 This well written, entertaining novel is highly recommended as an engaging and relevant read for teens and adults, as are McCaffrey’s previous YA novels including Destroying Avalon and Crashing Down.